Update 1.63 "Desert Hunters(changelog) was introduced on 29 September 2016. The update is distinguished by introducing High-resolution Texture Streaming (reducing loading times) and introducing a large number of new vehicles. Improvements to the detail shown in the ground forces damage camera: Now more detail is shown with damage inflicted from module hits. Added the display of Mach numbers for aircraft in critical speed situations and with the destruction of the aircraft structure. Fixed AI Fighters attacking ground units when not equipped to do so. When a player is disconnected from the Network, an AI player takes over control of their aircraft. Church in the center village has been added. Changes and improvements in balance. The water tower has been replaced by a Church. Fixed bridge and bridge support collision with aircraft and ground vehicles. Tracer effects have been improved. Tank fire effects, explosions and ammo rack fire effects have been improved. Aircraft wreckage physics have been improved. Fixed the animation of ailerons and flaps on some aircraft. Fixed the location of leaks, smoke and fire of engines in a number of multi-engine aircraft. Added smoke that occurs when the engine is damaged or faulty. View and zoom controls can be configured separately for different unit types. Control settings properly apply when device configuration is changed. The ability to assign keys to activate the "Crew replenishment" function has been added. A bug pertaining to aircraft with an optical sight, where changing view would result in it not saving the previous angle of view, has been fixed. In all “Operation” type aircraft missions, the spawn mechanism of light units closer to mission end has been changed. Early in the game, all vehicles will spawn on any one of the available zones and destroying one vehicle will result in a score reduction. Now light vehicles spawn in three different zones and for each vehicle group there is a separate available task. Destroying units in the groups will not reduce the mission scores. Destroying all of the vehicles in the group will complete the task and cause a reduction in mission scores for the enemy team. Completing all three tasks will cause the scores to be reduced by 30% at a maximum. The amount of the score reduction may be adjusted in the future based on player feedback. Fixed a bug related to the inability to destroy air defense guns on the ground ("Tunisia", "Mountain valley" and some others). Sound environment in a ground vehicle and aircraft hangars has been improved. New collision scraping sounds for ground vehicles have been added. Ki-49 (all modification) Machine guns models have been fixed. La-5 (all modification) - Fixed the shape and thickness of the pilot's headrest armour. Lа-7 (all modification) - Fixed the shape and thickness of the pilot's headrest armour. Lа-9 - Fixed the shape and thickness of the pilot's headrest armour. F3F-2 - Damage Model has been updated. A-26C-45 - Displayed armour has been fixed. XP-55 - Displayed armour has been fixed. Me 410 (all modification) - Displayed armour has been fixed. Do 17Z-7 - Displayed armour has been fixed. Ki-49 (all modification) - Displayed armour has been fixed. PBJ-1H - Displayed armour has been fixed. PBJ-1J - Displayed armour has been fixed. F9F-2 - Displayed armour has been fixed. P-400 - Displayed armour has been fixed. P-39K-1 - Displayed armour has been fixed. Р-39N-0 - Displayed armour has been fixed. Р-39Q-5 - Displayed armour has been fixed. He 111 H-16 - Displayed armour has been fixed. B7A2 - Displayed armour has been fixed. B-57B - Displayed armour has been fixed. TBD - Displayed armour has been fixed. B-25 (all modification) - Displayed armour has been fixed. B-17 (all modification) - Displayed armour has been fixed. Bf 109 G-6, G-10, G-14, K-4 - Fixed the damage model of internal modules. J2M (all variants) - Corrected the specification of the thickness of bulletproof glass. B-29 - Added the fuel tank in the center section. Changed the damage model for the deflecting surface. Yak-3 - Ammunition capacity for the UBS machine guns has been changed from 250 to 150 according to the "Weapons of Yak-3 Operating Instructions" of the Office of the Military Air Force Red Army on May 12, 1945. Paragraph 1 - The armament of the Yak-3. Wyvern S.4 - Bomb drop for the 3 x 1000lb has been corrected. For all ground vehicles of the 5th rank, the multiplicity of the optical sights has been set up in accordance with the real models. This change is intended to equalize the chances of tanks in a confrontation with vehicles equipped with ATGMs. Armour for KV-85 and IS-1 has been refined. Mechanics of the "Rangefinding" command have been improved. From now the horizontal risk is static, meaning that the player enters the range by adjusting the angle (depression) of cannon elevation. Damage from 30-50mm caliber anti-aircraft guns from impact with different types of aircraft has been fixed (increased). The bug, where in some cases after hitting a crew member, further spalling took place with the creation of secondary splinters which caused damage has been fixed. Fragments from shells incorrectly ignored modules such as engines and transmissions. This has now been fixed. Mechanic of replacement for crew members in the vehicles with open tops has been changed. Animation of a failure of crew member to appear when replaced has also been implemented. The chance of ricochet has been significantly reduced if the ammo caliber/armour thickness ratio is more than 30%. Unarmoured vehicles are now more likely to take damage after HE shell hit. A bug where destroyed vehicles with their turrets gone were still shown as intact has been fixed. Spaced/Applique armour is now taken into consideration for ricochets off the main armour. KV-220 - tank model has been fixed (gun mantlet) including the armour of the MG socket mount. The gun breech and crew can no longer be damaged through the gun barrel. Т-62 - tank model has been fixed (projector drive animation), fixes in “x-ray” view and damage model (turret, gun barrel, turret ring, bottom of the tank, lower front plate). KV-1 ZIS-5 - inconsistency of the sizes and shape of the Damage Model and visual model of the turret has been fixed. KV-2 1939 - optics allocation has been fixed. T-34 (all modifications with F-34 cannon) - protection for the recoil cylinder has been added. Conqueror Mk.2 - X-ray view of the vertical aiming drive has been fixed. Damage model has been fixed - lower and upper front plates. Т-34E - visual model has been fixed - gun mantlet used to pass through crate. Т-34-85E - Damage Model fixes, (part of the damage model of the external armour used to rotate along with the turret). Т-III and KV-1E - Winter “solid” camouflage was replaced by winter “grid” camouflage, which is available for some premium vehicles. Crusader Mk.II - bugs in rear air vent’s Damage Model have been fixed. SU-100Y - visual model fixes - driver’s hatch has been fixed. Pz.Kpfw. III Ausf. B - Armour has been added to the chassis and MG socket . Pz.Kpfw. V Ausf. A, Ausf. D - Placement of the ammunition allocation in ammo racks has been fixed. M103 - Armour of the weapon porthole has been fixed. Pz.Kpfw. IV Ausf. J - Armour for housing roof and turret has been fixed. Tiger II Ausf. B (H) - fixed spacing of gap (about 5mm) between the hull and turret. Ferdinand - The Damage Model for double armour and issues with the positions of the internal modules have been fixed. Jagdpanzer 38(t) - The issues with the positions of the internal modules have been fixed. Leopard 1 - Armour for the gun mask has been fixed. Added anti-aircraft machine gun. Ostwind - Visual model has been fixed, two shells for holder has been added. M46 / M46 Tiger / M26 / M26E1 - Wrong geometrical sizes of the gunport has been fixed. Neubaufahrzeug - Damage Model of the crew, which was partly outside of the vehicle has been fixed. Strv 81 - Damage Model for launchers of ATGMs has been added. Sd.Kfz. 6/2 - The driver animation issue has been fixed. Cromwell I - The size of the shells in the Damage Model and X-Ray has been fixed. Tiger H1 and E - The visual size of the driver optics has been fixed. Achilles - Engine Damage Model has been updated. Firefly “Scorpion” - Wrong engine and radiator models in the X-Ray have been fixed. Post War German vehicles received tri-colour camouflage scheme of the CARC. М26 (all modification) - Added anti-aircraft machine gun. When overheating (coolant leakage for example) occurs in the coolant or cylinder block, the temperature of the oil will also increase and with the oil overheating, the temperature of the coolant and cylinder block will further increase. Bug, where damage occurs in the first fuel tank, it was possible to lose all fuel, has been fixed. The behavior of a damaged engine has been reworked. Now when the damage level increases the remaining operating time of the engine decreases smoothly and no more depends on airspeed. The incorrect connections between engine and the oil and water radiators which was installed on some aircraft has been fixed. Wing floats now will also disappear in the physical model when wings are lost and will be hidden in the wings when they are retractable. The propeller will break not only on contact with surface, but also after collision with objects. Aircraft damage occurring when due the exceeding the maximum safe Mach number now works the same as exceeding indicated speed, this means with delay and an indication on the HUD. The APC (aircraft performance characteristics) calculation in the card for turboprop aircraft has been fixed. Thrust will now be 0% on complete fuel exhaustion (when it is empty), the engine will not operate after that point. Ki-84 (all modifications) — The temperature modes for the engine have been refined. He 111 (all modifications) - Specified calculation for airflow on the horizontal tail surfaces, Inertia calculations updated and damped in all axes. Edited inertia calculations. Improved handling in all flight modes. A * header tank for inverted flight has been added. SM-79 (all modifications) - FM and thermodynamics have been reworked. Impact of airflow and control stiffening have been added. Maximum speed and climb rate have been corrected. Separate fuel tanks enabled. Fuel consumption rate depending on different engine thrust rating has been updated. Also refueling has been reworked - main tanks are refueled first and then additional. Fuel in additional tanks is consumed first. B-24 FM and thermodynamics have been reworked. Impact of airflow and control stiffening have been added. Maximum speed and climb rate have been corrected. Separate fuel tanks enabled. Fuel consumption rate depending on different engine thrust rating has been updated. MiG-15, MiG-15bis, MiG-17 and IL-28 - engine operating temperatures have been updated. P-63 (all modifications) - flap air resistance and brakes efficiency have been corrected. P-51D (all modifications) - The system of priority order of consumption in fuel tanks has been activated. Depending of the amount of fuel, the centre of gravity changes are more Pronounced. The fuselage resistance at high speeds (dynamic acceleration within the dive) has been recalculated. Thermodynamics have been verified. Fiat Cr.42 - Thermodynamics has been updated. Polar of the propeller and wing section has been corrected. Bf 110 С-4 - Bug, where by damage of the oil tanks and water radiators of the right engine caused damage on the left engine and vice versa has been fixed. TBF-1c - Engine characteristics have been refined, switch over point for the charger is now at 11,000 feet. The maximum speed at maximum altitude has been increased. Thermodynamics have been adjusted. Wing polar, tail and fuselage have been adjusted. Primary polar and parameters of flow bevel have been adjusted. Behavior of the aircraft in different flight modes has been corrected in accordance with the AFM (Aeroplane Flight Manual) and teaching materials. Combat and take-off flap position have been removed, maximum speed of the flaps position switching has been increased. Maximum dive speed has been increased (Vne=315 knots - AFM). Top speed of the chassis releasing - 200 knots, Top speed of the landing flaps releasing - knots. Brake force has been increased, so it is possible to stay on the place with brakes by full engine power. The system of separate fuel filling and consumption of fuel from tanks has been switched on. Amount of fuel on board and fight loading (bombs and ammo) affect more the centering of the plane. Pressure in the struts, for better fit the deck, has been decreased. Su-6 — Has been initially configured according to the data sheet. Ki-87 – Has been initially configured according to the data sheet. J1N1 – Has been initially configured according to the data sheet. P1Y1 – Has been initially configured according to the data sheet. BV 238 V1 - Has been initially configured according to the data sheet. Brigand B.1 - Has been initially configured according to the data sheet. Hudson Mk.V - Has been initially configured according to the data sheet. F9F-8 - Has been initially configured according to the data sheet. G-suit mechanics have been fixed for all aircraft. Vehicle price is now shown correctly after activating personal discount. Incorrect values on specific modification bonuses for Yak-9-T have been fixed. Absence of the ATGM launch sound in test drive has been fixed. Vehicles do not lose speed anymore whilst the player is checking the statistics window. T-34-85E “stripe” decal has been fixed. Flakpanzer I, ZSU-57-2 - Spawn point requirement in RB has been increased. For 85mm USSR cannons with ballistic D-5T/ZiS-53 - the research order for these shells has been changed. The first standard shell (for free) is now BR-365K, and shell BR-365A is now researchable. ZiS-30 - Vehicle rank has been changed. The cost of purchasing the vehicle has changed from 2,100 to 10,000 lions. Changed the number of research points required to research the vehicle from 4,000 to 7,900 RP. Crew training price changed from 600 to 3,000. PzKpfw IV Ausf F - Vehicle rank has been changed. The cost of purchasing the vehicle has changed from 5,900 to 10,000 lions. Changed the number of research points required to research the vehicle from 4,000 to 7,900 RP. * Crew training price changed from 1,800 to 3,000. M15 Combination Gun Motor Carriage - Vehicle rank has been changed. The cost of purchasing the vehicle has changed from 55,000 to 77,000 lions. Changed the number of research points required to research the vehicle from 14,000 to 18,000 RP. Crew training price changed from 16000 to 22,000. ZIS-12 94KM - Vehicle rank has been changed. The cost of purchasing the vehicle has changed from 38,000 to 77,000 lions. Changed the number of research points required to research the vehicle from 11,000 to 22,000 RP. Crew training price changed from 11,000 to 22,000. P-47N-15 - The cost of purchasing the aircraft has changed from 190,000 to 230,000 lions. Changed the number of research points required to research the aircraft from 50,000 to 70,000 RP. Crew training price changed from 55,000 to 65,000. Repair cost has also been changed. P-38L-LO - The cost of purchasing the aircraft has changed from 310,000 to 190,000 lions. Changed the number of research points required for the research aircraft from 85,000 to 50,000 RP. Crew training price changed from 90,000 to 55,000. Repair cost has also been changed. P-38J-15 - The cost of purchasing the aircraft has changed from 300,000 to 190,000 lions. Changed the number of research points required to research the aircraft from 80,000 to 50,000. Crew training price changed from 87,000 to 55,000. Repair cost has also been changed. Ki-84 ko - “Jungle” Camouflage has been removed from sale. Ki-49-1 - Added 20mm gun turret modification research..
SM.79 1936 - Removed engine injection modification. I-153 M-62, I-153 M-62 Zhukovsky - Removed bomb load option 2x100 kg. according to "Airplane-153 with an engine M-62. Technical description. Book 1. Oborongiz - TsAGI, Moscow 1940 ". Fixed German and French keyboard layouts on the “help by clicking F1” display. Aircraft travelling at high speeds will now move correctly when being viewed in the replay mode. A bug where AI in ‘Enduring Confrontation’ battles would not start from the airfield, has been fixed. After the activation of a personal discount, the price of the vehicle in the research tab will now be correctly reduced according to the discount. Improvements have been made to the squadron search window. FPS drops in the hangar after vehicle unlocks have been fixed. Artillery control with joysticks has been improved. New hangar has been added. Pier for flying boats and other naval vehicles..
Bug where after extinguishing a fire the ground vehicle wouldn't move has been fixed. Multiple enhancements to virtual reality headsets. Bugs where the sounds of other players being hit were not being played has been fixed. Test flight for naval piston-engine aircraft will now start from an aircraft carrier. KV-220 BR-365K (incorrectly added) has been replaced with the BR-365A ammo. A bug where ZSU-23-4 was not able to rearm on the cap point has been fixed. Rangefinder position in the gunsight has been fixed. Problem with downloading custom hangars and locations has been fixed. Spawn point requirement for ZSU-23-4 has been fixed. Damage of APHE rounds has been increased. This change was made to maintain damage effects (as it used to be) after fixing the DM in the 1.63.2 update (Fragments from shells incorrectly ignored modules such as engines and transmissions). A bug where it was impossible to put 3d decorations on the BT-5 and RBT-5 turrets has been fixed. Visual effects for aircraft 30mm (and higher calibre) cannons HE shells hitting water, ground and ground vehicles has been improved. Crash fixes and client stability improvements. Me 410 (all modifications) - armouring has been updated. F2A-3 damage model has been reworked. Flaps damage model has been improved. User missions: fixed a bug which caused some of missions to be missed from the list in UI. PS4: Dualshock(r)4 axis and button names have been fixed. PS4: User control presets have been fixed. A bug where destroying a T20 did not count as a kill in the statistics has been fixed. A bug with the Conqueror Mk.2 bottom armour has been fixed. A bug with the T-26E hull armour has been fixed (driver’s hatch was not armoured). A bug that assumed the incorrect height on the ZSU-23-4 and Gepard while calculating vehicle drowning has been fixed (both SPAAGs counted higher than they are). Brummbar’s mini-map icon has been fixed (previously it was displayed as a medium tank instead of an SPG). A bug where it was impossible to mount 3d decorations on the T-26-4 turret has been fixed. Bf 109K - excessive engine overheat has been fixed. P-51D (all modifications) - engine overheat and cooling has been corrected. The amount of SP (spawn points) for kill assist in RB for ground vehicles has been increased. PS4: fixed crash when returning to hangar after battle. A bug where engine thrust dropped when a player opened controls menu has been fixed. A bug has been fixed where a player selects a control layout through the "Control Setup Wizard" and then removed one of the default key bindings through the "Controls" options menu, it would then reset the key binding to the default key after a client restart if left empty. T-29 - incorrect gun mantlet thickness has been fixed. A bug, which would occur when controlling tanks with a gamepad during artillery aim or when selecting a radio command, has been fixed. Several bugs that caused micro-freezes during battle have been fixed. Mechanics that allow players to reconnect to a battle have been added. A bug which would occur while changing the angle of view on an aircraft with telescopic sights to the “sniper” mode has been fixed. M6A1: a bug that would not allow neutral steering has been fixed. A bug that prevented one side of the tracks from being stationary while turning has been fixed. I-153 (all modifications) - Specified calculation for airflow on the horizontal tail surfaces, Inertia calculations updated and damped in all axes (less “bobble” with full controls). Edited inertia calculations. Improved handling in all flight modes,the system of separate fuel filling and consumption of fuel from tanks has been switched on (controllability improved) . Ki-61 (Ko, otsu, hei) - operating canopy has been added. A7He1 - Specified calculation for airflow on the horizontal tail surfaces (less “bobble” with full controls), Inertia calculations updated and damped in all axes. Edited inertia calculations. Improved handling in all flight modes,the system of separate fuel filling and consumption of fuel from tanks has been switched on. A header tank for inverted flight has been added. J2M (all modifications) - Specified calculation for airflow on the horizontal tail surfaces, Inertia calculations updated and damped in all axes (less “bobble” with full controls). Edited inertia calculations. Improved handling in all flight modes,the system of separate fuel filling and consumption of fuel from tanks has been switched on. The cooling system performance has been corrected (it takes more time to overheat). MiG-3 (all modifications) - Data sheet characteristics have been corrected. Separate fuel tanks have been added, thermodynamics have been implemented according to the performance of the original radiators of the aircraft. (it takes more time to overheat). Fw 190A (all modifications) - Completely new FM that includes all recent updates such as fuel tanks consumption priority, inertia calculations, centre of gravity changes. Data sheet updated. (better controllability at high speeds, nose-heaviness reduced). Fw 190D, Та 152 (all modifications) - Flaps performance has been corrected (take-off and landing became easier), centre of gravity has been corrected. The moment when the M reaches critical moment has been recalculated. A bug where the game did not indicate the start of a battle (game icon in the task menu did not flash) while game client was minimised has been fixed. A bug where incorrect number of remaining back-ups was displayed has been fixed. A rare bug when re-connecting to a game that had ended caused a crew lock has been fixed. A bug that prevented the “free” (floating) camera from activating has been fixed. A bug where the standard camo was not “remembered” on a specific ground vehicle when chosen in battle has been fixed. A rare bug which would occur during airstrikes in ground vehicle Arcade Battles, where the weaponry of an aircraft would be inoperable when attempting to fly it again, has been fixed. A bug, where switching control modes would cause mouse-aim to become inoperable, has been fixed. In the battle results you can now see detailed information about from which bonuses the award will be calculated: basic award, talisman, premium account, boosters. Air AB: +10% to modifications, -10% to vehicle research. Air RB: +20% to modifications, -15% to vehicle research. Air SB: +30% to modifications, -20% to vehicle research. Ground battles (AB, RB and SB): +10% to modifications, -10% to vehicle research. BR changes for aircraft and ground vehicles (click here to check the list of changes). Costs for repair of aircraft and ground vehicles has been slightly revised. (click here to check the list of changes) Purchase cost for MiG-15 has been reduced and for MiG-17 increased. Battles in Realistic and Simulator battles require better accuracy, aiming and precision. The players in these modes hardly ever hit their allies unintentionally. That’s why we decided to turn off friendly fire damage from guns, tank mounted rockets and missiles and MGs. Damage from friendly aircraft rockets, bombs and artillery is still possible. Real tank sights magnification has been implemented on rank IV ground vehicles, except for a few vehicles that had real magnification of less than 3x (Panzerbefelhswagen VI P, Pzkpfw VI Tiger P, A43 Black Prince, IS-2 1943, ISU-122/122S/152). BR’s in RB for following vehicles have been changed: B-18А - from 2.3 to 1.7, KV-122 - from 6.0 to 5.7. The visual representation of the moon when viewed from ground vehicles, especially in sniper view, has been improved. A new festive halloween-themed hangar has been added. The aiming reticule display for rocket tanks has been fixed. The halloween-themed hangar has been replaced with the normal hangar. A bug where it was impossible to report a user who created a chatroom has been fixed. A bug where sometimes Squadron chat tab was not displayed has been fixed. A bug where holding the PrtScr button in fullscreen mode resulted sometimes in a freezing of the client, has been fixed. A bug where screenshots were not created in compatibility with old videocards mode and with anti-aliasing, has been fixed. RakJPz 2. A bug where the sniper scope was shifting whilst targeting some obstacles has been fixed. A bug where in some cases, the incorrect crew research value of the ace qualification was displayed, has been fixed. La-5FN. A bug where by selecting the modifications; “Rear armor plate” and “Armored glass” in the X-Ray view, displayed the incorrect armour values, has been fixed. A bug where for OS (Operating System) WS2012 and WS2016, Dx11 was chosen automatically, has been fixed. A bug where closing the client for an aircraft in bailout lead to extra death as being counted, has been fixed. A bug where in aircraft battles, it was possible that the texture of the moon was displayed in low-resolution has been fixed. A bug where by flying through the clouds resulted in the textures flickering, has been fixed. A bug where the position of the landing gear lever was show in the incorrect position has been fixed. Significantly improved synchronization of destruction of object collision with tanks. Fuel tank detonation mechanics have been changed. Now, if the tanks are partitioned off from the crew, the ammo rack their explosion may not destroy the tank. Explosion parameters depend on the fuel tank volume. Hit marks and penetration holes have been updated. Control settings are grouped by type of the vehicles and general controls has been moved to separate tab. In each tab control settings are grouped and navigation bar has been added. Settings group “Controls mode”, which partly duplicates the switch for the instructor mode: AIM, simplified, realistic, full-real, has been added. Now by setting of different instructor modes you can see which options are active in this instructor mode. Possibility to switching off the instructor modes in the battle has been added: Aircraft control > Controls mode > Toggle controls mode. The using of the manual or automatic transmission is no longer dependent on the instructor mode, but can be switched in separate setting: Tank control > Movement > Automatic transmission. Possibility to switch manual/automatic transmission mode during the battle has been added:: Tank control > Movement > Transmission mode. A bug related to the inability to remove assigned to the 5th joystick button to exit in the menu can be reassigned now: Common controls > Interface > Menu. A bug that occurred when the settings were reset to default, the axes adjustments were not reset, has been fixed. A bug where it was not possible to remove the assigned key for view switching, has been fixed. If a player has at least one rank 5 vehicles in any nation, they will receive 2 additional presets. Thus maximum number of vehicle presets is increased by 2 (2 for tanks and 2 for aircraft). Switching to the next vehicle after closing the statistics window or a map in the spectator view has been fixed. A bug where rockets were moving by fits when turret was rotating has been fixed (Cromwell RP-3, M26 T99). Stalingrad. A bug where it was possible to shoot through the walls of some buildings, has been fixed. Gaijin.Net Agent - “Background Update” option has been added. Launcher will check automatically if there are any pending updates available to download. Optimization of the aircraft selected at the beginning of a battle (for Germany). A more even distribution in the BR fork at 5th rank in “Enduring Confrontation”, with the aim of reducing the multitude of timer locks for vehicles with more or less similar characteristics. Spontaneous damage to the tail on the Nimrod MK2 during acceleration (Tarakanator, J1775_Venom). XP-50: Spontaneous motor failure by increasing of the thrust (RedTribe). Error by displaying of the crew skill for aircraft under certain conditions (IFF_). Error by saving of the control settings (A_Peryite). RakJPz 2 HOT wrong performance (Zoober). Wrong Squadron tag display in friend list has been fixed. No ammo indicator in replays has been fixed. Statistics window not working in battle has been fixed. Bug that caused AI to crash on the airfield has been fixed. Wrong display of the fuel pod in B-57A X-ray view has been fixed. A bug where some sounds were missing in the aircraft cockpit has been fixed. A bug where ground vehicles were not being displayed in some cases (incorrect server visibility) has been fixed. Unnatural wobbling of the Hawker Hunter has been fixed. Some micro-freezes in air battles has been fixed. A bug, where the sound of ground vehicle didn’t change when switching from sniper sight to 3rd person view, has been fixed. A bug, where the radial command window wasn’t working during battle, has been fixed. A bug, where the sound of engine start for single-engine aircraft was from the right wing, has been fixed. Bug with displacement of viewpoint in the telescopic sight at horizon level, tarmac on the runway now displays correctly. A bug that caused quick commands to cancel zoom, whilst zooming in have been fixed. A bug where the camera “changed axis” in the operator’s view during a replay has been fixed. A bug, where axis settings on the keyboard would perform incorrectly, has been fixed. A rare bug on the location “Stalingrad”, where in some cases during combined battles destroyed train carriages would be restored, has been fixed. AD-2 Skyrider - Fixed a bug where the rocket disappeared out of sight from within the cockpit view. Meteor (All variants) - Fixed a bug where the landing gear, whilst retracted led to the death of the pilot. On graphics cards with 1GB of memory, high quality texture is now (again) available. A bug that caused freezes when buildings were destroyed has been fixed. Rewards for destroying naval vessels and ground AI targets in air battles have been increased by 10%. 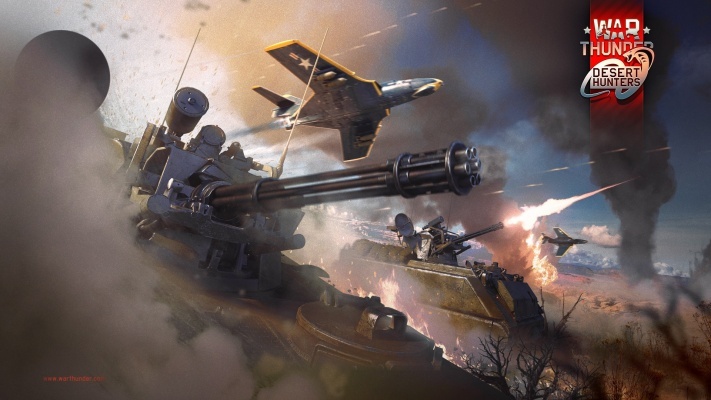 Rewards for destroying different types of vehicles in ground battles have been adjusted (reduced or increased) in accordance to the rewards in SL. A bug where after firing ATGM’s they didn’t disappear on the tank damage indicator has been fixed. This page was last edited on 5 March 2019, at 19:10.